Dec. 17, 2014 5:00 p.m. The Wetaskiwin Hospital Auxiliary has a long and loyal history of supporting healthcare in this community. The magnitude of volunteering by the members is absolutely amazing, as the Hospital Auxiliary contributes approximately 8000 hours of volunteer time each year resulting in their ability and willingness to invest thousands of dollars in healthcare in this community. 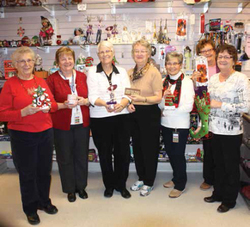 On November 27th, 2014, the Auxiliary hosted one of their major fundraisers, the Wetaskiwin Hospital Auxiliary Appreciation Day and Sale in the Wetaskiwin Healthcare facility (Hospital). Although the Auxiliary has supported the purchase of some state-of-the-art equipment that has enhanced delivery of healthcare in this community, they maintain a primary focus on providing items and programs that contribute to the comfort of patients. Many of the purchases are not considered essential to healthcare and cannot be done through the budgeting process, but they are very important to patients and residents. The gift shop operated in the Hospital is one of the Auxiliary’s major sources of fundraising. Conveniently located in the entrance of the hospital, the shop maintains a selection of items to meet the needs of patients and visitors from flowers to magazines to baby gifts. As budgets decline and the need for healthcare services increase, there is a growing reliance on supporters such as the Wetaskiwin Hospital Auxiliary to make up the shortfall. The Wetaskiwin Health Foundation acts as the funding facilitator by accepting funds and ensuring they are invested in causes that best meet the wishes of the Auxiliary. Congratulations to the Auxiliary for hosting a successful Appreciation Day and Sale and investing the proceeds into helping provide better healthcare for all residents of our community. The Wetaskiwin Health Foundation is the essential link for creating and managing partnerships and alliances between healthcare representatives and individuals, service clubs, foundations, corporate representatives and government. The correct mix of partners and resources are matched to satisfy the values of the donor and the needs of healthcare. For more information contact Foundation Executive Director, Lillian Dykes at 780.361.4130.